The Daily Create for today was pretty interesting. Given a prompt from an idea generator website, we were supposed to write a blog post. A couple of people shared titles that had to do with the Amish and DS106. These two things, a religious group that eschews technology and a digital storytelling course that is centered on technology, seem to be as far removed from one another as possible. Now I am far from an expert on the Amish, but I have encountered a few from time to time here in Kansas and have read a bit about their culture. So I’d like to take a stab at this one. First of all, as I understand it, much of the Amish resistance to the adoption of new technologies has more to do with humility than it does with hatred for the new and high-tech. A few years ago, we visited the town of Yoder, KS, where a large community of Amish people live. We noticed that there were occasional telephone booths located along the roads in the countryside. A guide explained that multiple families share the telephone, and it is placed on a property line so no one can claim ownership. According to our guide, it is the ownership of these various things that can lead to the sin of pride . This explanation cleared up another question I had long wondered about. 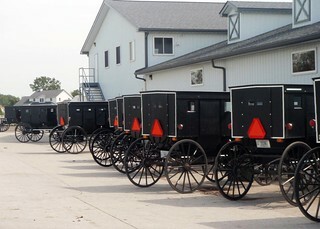 Why could Amish people ride in automobiles, but would not own one? Well, now it made sense. According to the explanation we received, it has to do with pride and ownership, not a hatred of technology per se. So what can the Amish teach us about DS106? Firstly, I would suggest that they have priorities established and they keep them. Participating in DS106 is highly demanding. To be successful, you have to have priorities in order, or you will quickly be overwhelmed. And it goes without saying that the Amish do not take the easy road. They are hard-working people. DS106ers should absolutely follow the Amish ethic of hard work. Another thing about the Amish is they are frugal and resourceful. So are those in DS106. Both groups don’t throw things away. They remix, recycle, and reuse things. They look for whatever tools are available to get the job done. The Amish and DS106ers don’t need the latest, greatest tools to get the job done. They don’t upgrade for upgrading’s sake. Finally, the Amish help one another. If a neighbor puts up a barn, the whole community is there. This attitude is central to DS106. We comment, we compliment, we support one another in our efforts to learn. I think the Amish have a lot to teach us about DS106. Author’s Note: After writing this, I searched the Internet for “Amish Hacker” and found this must-read piece by Kevin Kelly on Amish Hackers. Check it out, it is spot on right. Fifty years ago, one of the best television shows ever made was first aired – Star Trek! We love Star Trek at my house. A few years ago I made this video of myself and I thought it appropriate for today. So we made this video in our Digital Media class. Sulu, get those shields up! PS I made a vector of Spock in celebration of Star Trek 50 too! This is a DS106 visual assignment that challenges us to remix an existing corporate logo with a bad font (or an improved font). At 4 stars, I think the difficulty rating is somewhat inflated. Granted, I’ve been doing this kind of work for a while, but this assignment only took me 5 minutes to complete. It is taking me longer to create and publish a post about it. My process used was simple. I did a Google image search for the “John Deere Logo.” Then I downloaded the image and placed it into Adobe Illustrator. I used a clipping mask to remove the old John Deere Text. Then I used the text tool to reset the type in the over-used Papyrus font. I then saved the image as a PNG graphic and uploaded to this website. Boom- done! My rating for the assignment difficulty was a 1 star. For a beginner with no graphic-making experience, it might take a little longer, but certainly no more than 2 or 2.5 stars. So to take it up a notch, I followed Paul Bond’s lead and put the Papyrus font onto a John Deer product. Create a short video that shows a scene from your favorite TV show or movie that we didn’t get to see. Maybe because it wound up on the cutting room floor. Here is an example. It is from Star Trek TOS and depicts a red shirted crew member getting ready to beam down for the first time.